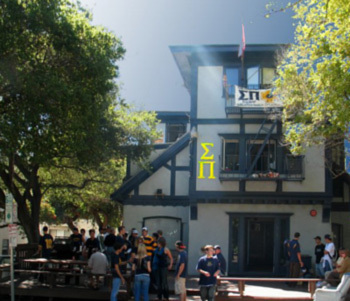 The Iota Chapter house is located at 2434 Warring St., Berkeley, CA 94704. From the Unit 1 dorms it can be reached by walking up Channing Way, taking a right on Warring St. and walking five houses down until you see it on the right. The house has four floors, with thirteen large bedrooms spread amongst them. The ground floor has an industrial kitchen, a large living room with couches, an HD TV equipped with DVR recording, and a newly installed 7.2 surround sound system sure to cover all spectrum of the music entertaining the house and her guests. The basement floor includes a large dance area which mimics the most extravagant club atmospheres. Complete with dance lights, an industrial grade Pioneer sound system, and a state of the art light up bar, there's no better place in Berkeley to dance and have a good time.